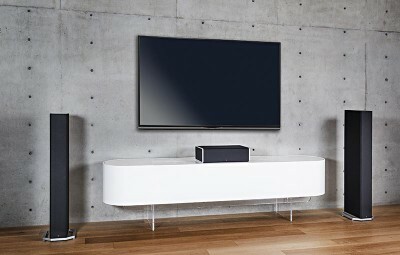 The CS9060 center channel is one model below the CS9080 for Definitive’s flagship center channel. The $699 speaker isn’t your typical center channel. It boasts a frequency response of 32Hz – 40kHz. The 1-inch dome tweeter is flanked with two 4.5-inch bass-mid woofers and an 8-inch powered subwoofer. The CS9060 is not a bipole design. There are no rear-firing drivers. It’s therefore easy to put the CS9060 inside or on top of a cabinet. All speaker models (save the A90 add-on) are powered by a Class D amplifier. You’ll therefore need to make sure you have an electrical outlet close to each speaker location. This entry was posted on February 24, 2019, 7:13 pm and is filed under Home Theater Audio System, Review. You can follow any responses to this entry through RSS 2.0. You can leave a response, or trackback from your own site.